And the episode of The Golden Girls with Dorothy’s lesbian friend is on. It’s still just as awkward as it was when it originally aired. It wasn’t working in a germ factory, or even going out with a wet head that got me congested and sniffly, but I think it might have had to do with some spicy fries I ate on Saturday night after Salsa Saturday and could still taste Sunday afternoon. Ever since then, I’ve been mostly just sniffling, with a few minor coughs and a sneeze here and there. It feels like I have water in my nose, and that my eyes just want to close. I’m not sure that it’s a sore throat, because cough drops only irritated it more. Today, while teaching my first class, I had a fit of hacking, at the end of which I pronounced “brb, dying,” and after one or two more coughs, pronounced myself dead. But hey, when you’re teaching Samuel Beckett and the Theatre of the Absurd, it works. Anyway, all I wanted to do after I got home from school and meetings was to lie down on the couch and watch TV. I flip through channels, and go through the TV guide, and…nothing appealing. When I’m well, there are all sorts of things that I’d like to watch but either don’t have the time to or just forget about. But of course, when I want to relax and watch something good, all that’s on: sports, weather, news, infomercials, crappy Christmas movies (which could be its own generator, future post idea! ), televangelists, murder dramas, pointless reality shows, and whatever’s on the Spanish channel. I could go to bed early, or read or lesson plan or something, but I think I’ll just write a blog post about it and see where it goes. Today, I found out that Catherine E. Coulson died. I heard about it first via Facebook, from my friend Melinda who posted about the actress’s work at the Oregon Shakespeare Festival. Naturally, I assumed she was some dame, playing Emilia and Isolde and Lady Macbeth. And then, I looked a little further, and realized that she was The Log Lady, also known as one of the best and funniest McGuffins in television history. I was too young to watch the series in its original airing, but ever since the news of a possible reboot, I’ve been working my way through the too-short run of Twin Peaks on Hulu. I started watching it last semester and made it to the middle of the second season before I just stopped watching it and then couldn’t remember where I’d left off so I left it for a while and haven’t returned, but now, I just might have to do just that. For those of you who are not American, or have just never heard of Twin Peaks, it’s basically this eerie drama about (first episode spoiler alert) a detective finding out who killed Laura Palmer, a small town prom queen in Twin Peaks, Washington. Though the episodes are full of twists and turns, the language and imagery is spellbinding. When I watch it, I can almost taste that Pacific Northwest rain. And the best part of is that no one is innocent. Everyone’s hiding something, even the detective himself. David Lynch is known for his unconventional and haunting work, but the silence of Twin Peaks just amps the creepy up to full. And then, enter Coulson as The Log Lady. Basically…that was her character. She was a lady who walked around town cradling a log which she claimed had magical powers. Occasionally, her predictions were correct, but in all those cases she and her log either gave vague, tangential information, or were just plain lucky. There were all sorts of theories about her and her purpose in the show, including some that she was actually the only sane person or the only truth teller in the whole town. To me, though, and I think to most, she was just a crazy lady with a log as a best friend. She doesn’t really go through any changes, she just kind of exists, toddling around the town, not really much different than in earlier or later episodes. And if that’s the most normal thing in the town of Twin Peaks, then you’ve got a lot to look forward to, so head over to Hulu and make yourself some coffee and pie. 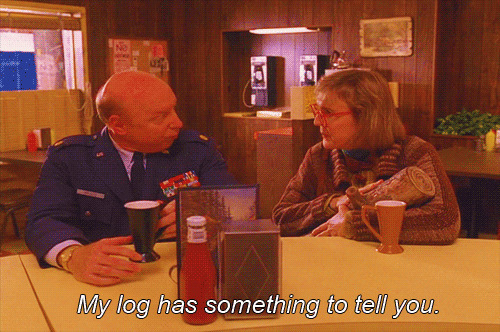 But for now, let’s reflect on some gifs of the Questionable Wisdom of the Log Lady. Catherine E. Coulson, rest peacefully. Last year, I made a fake awards ceremony, but this year, since a) I don’t care as much and b) I’m on the couch in a t-shirt and workout pants and it’s 4:38 PM here in Wisconsin (granted, it’s a Sunday), here are my picks for the top sixteen. I will probably only get maybe one or two of these predictions correct, but it will be kind of fun to see if my magical powers of prediction work. I have broken them down into three categories. The first five: They’ll Get A Placement Even If They Decide to Stay in their Hotel Rooms and Watch Netflix. 1. USA (Nia Sanchez): Host country + it’s Miss Universe. No one will be surprised. 2. Venezuela (Migbelis Castellanos): She’s actually quite pretty and could be another back-to-back, but honestly, I think everyone’s tired of Venezuela always winning, especially in 3 out of the last 5 years. But she’s Miss Venezuela; she could be an alien who breathes fire and she’d still be called. 3. Philippines (Mary Jean Lastimosa): Because after Christianity, Miss Universe is the second-largest religion in the Philippines and 2/3 of the viewing audience would shut off their televisions if she got shut out. Plus, Filipino icon Manny Pacquiao is a judge this year. 4. Czech Republic (Gabriela Frankova): The brand new Miss Universe crown is designed by a Czech firm, so it’s almost a given that they’ll get a hat tip. 5. Puerto Rico (Gabriela Berrios): PR is quite close to Florida, geographically, so I’m sure that tons of Puerto Ricans will be in the audience and will leave if Gabriela remains on the stage after all have been called. The next five: Girls Who Are Kinda Pretty, Come From a Populous Country, and Will Probably Not Get into the Top Ten. 6. Colombia (Paulina Vega): She’s apparently been getting a lot of attention, and apparently is a front runner, although I don’t see it. 7. Spain (Desiree Cordero): Miss Spain will fill the European quota, plus she’s actually quite good-looking. 8. India (Noyonita Lodh): Also comes from a country of rabid pageant fans, plus fills the South Asia quota. 9. South Africa (Ziphozakhe Zokufa): Will fill the Africa quota. Also, has an awesome name that I can’t wait to see everyone attempt to pronounce. 10. Thailand (Pimbongkod Chankaew): Also from a rabid-fan country (see above, Miss India) and has another awesome, unpronounceable name (see above, Miss South Africa). Probably will win the fan vote. The final six (I get an extra one for myself because I do what I want): Girls/Countries Who I’d Like To See Place but Will Probably Not. 11. Jamaica (Kaci Fennell): Stands somewhat of a chance with a very unique, fashion-model look, and seems like a smart gal. 12. Gabon (Maggaly Nguema): Competed in several pageants already, including Miss World 2014, where she got noticed. Also, very pretty. 13. Germany (Josefin Donat): I’m liking her Jennifer Paige hairstyle. She seems like a rebel, the type of person who would take every opportunity to backhandedly stick it to Trump, so thumbs up for that. 14. Nigeria (Queen Celestine): Not a chance, but I watched this 15-second clip of her singing “Cups” on YouTube with Misses Turkey and South Africa and she has a great voice. I’d buy her album. 15. Ghana (Abena Appiah): No real reason other than her hair, which is gigantic. I bet it’s full of secrets. Either that, or snacks. 16. Israel (Doron Matalon): Mostly just because she’s Miss Israel. She has also managed to get the Trump some serious media attention this year with the Miss Lebanon selfie scandal, so that might earn her some points. Then again, last year’s Miss Israel hung out with Obama before the pageant and that got her nothing, so you never know. Okay, now to get off the couch and actually do something with my life. Kindly leave your comments of who you think will win below, or, like most of the rest of the world, read about it tomorrow on Wikipedia. It’s almost July, so apparently it’s also almost Christmas in July. Because the day after Thanksgiving until January 1 isn’t enough Christmas for the world. Six months ago I said that I didn’t resent Christmas that much, but when it comes in July…it’s ripe for resentment. Every single thing about it. Do we really need another month of Christmas movies, or made-for-tv Christmas movies with V-list stars? The first thing I think about when I think about Christmas is cold. COLD. I am done with that for awhile, at least. I don’t really care that I sweat all day outside and all night in my centrally-heated, temperature-controlled apartment, at least I’m sweating. It gets rid of some calories and is an excuse to enjoy iced beverages with more regularity. The same thoughts go for snow. You want snow in July? Go camping in Antarctica, and don’t do it on my TV screen. Cheesy Christmas movies have their time: between December 25 and January 1 when there’s nothing else on TV and it’s wicked cold outside, if you live in Wisconsin, that is. Not in July. And another thing…why can’t Summer in December be a thing? YES. Yes. Yes to the Yes. Hey networks, can we make this a thing? Let’s spend December watching Gidget and Beach Blanket Bingo and all those fun surf movies! Also, what movie is this from? I’ve still been thinking about Alice in Arabia, so consider this a Part II to yesterday’s post. Sometimes, I look at ideas by others and I think that, given the chance, I could execute them better. So, here are a list of pitches for television shows I’ve come up with that could feature Muslim characters without stereotyping, or at least that are better than Alice in Arabia. Here we go. Souad is a twenty-something Muslim woman who has left Afghanistan to pursue her dreams of being an ophthalmologist. In the pilot, we see her getting her acceptance letter to a university in America, and leaving with her family’s blessing. Souad thinks she’s got it all figured out, but upon arrival at school, however, Souad discovers that there’s more to America than meets the eye. Proudly sporting her traditional burqa, all that others can see are her eyes, which are usually in a book or looking into a microscope. Follow Souad as she struggles through navigating her new life and her new language, challenged by her fears for her own safety as well as that of her family back home; but revel in her triumphs of never giving up, and finding love where she least expects to see it, with a man who can look past her veil without removing it. One unique feature of this show would be the usages of two camera styles: one as Souad’s eyes and one as the eyes on Souad. Abdul, a young man of a wealthy Saudi family, spends every waking moment on the Internet, making friends all over the world through a computer simulation game where he is mayor of a virtual city. Things take a serious turn when he finds out that some of his citizens are not who they seem; he stumbles upon what he thinks is a virtual terrorism fantasy story that is an actual plan to kill a powerful figure overseas. For help, he reaches to the one person he still trusts: his virtual wife and first lady of the city, Nadia, a beautiful young player from France who speaks impeccable Arabic, in whom he has confided his deepest personal secrets, including this one. In the pilot, after they decide to team up to take this player and his real-life plan down, Abdul and Nadia video chat for the first time, Abdul is relieved when the beautiful young woman he’s dreamed of looks just like her pictures, but the truth comes out that she is not as far away as she seems: Nadia was born in France, but grew up and still lives in Tel Aviv, Israel, and is Jewish. Two Muslim sisters-in-law decide to open the first halal shish-kabob food truck in Boston, and turn Beantown (and their families) upside down with their newfound friendship, custom-painted truck, and unconventional ingredients. A recipe for fun. Estelle Reiner, we have liftoff.